The training of the horses entrusted to us is always done peacefully and with great care - and we never lose sight of our goal. Whether breaking in a young horse, preparing a horse for its first competition or training for the highest classes in dressage, we act according to your needs and the current level of training of the horse. 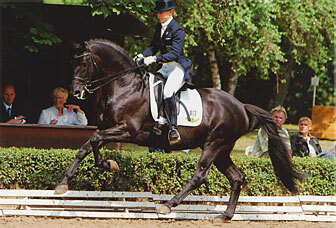 Equine dressage talent discovered here can be promoted and professionally presented to the public. Terhi Stegars and her professional team are happy to discuss your requirements.